The company is considering Toronto as well as 18 U.S. cities and one county. Amazon revealed the list of locations being considered for its second headquarters Thursday. The list includes 19 finalists in the U.S., including Chicago, Denver, Boston and Los Angeles. 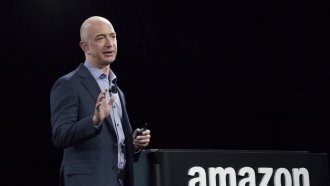 Amazon is also considering Toronto. The 20 locations were whittled down from at least 238 North American regions that applied. The company plans to spend more than $5 billion to build the new headquarters and could end up employing as many as 50,000 people there. Amazon's current HQ is in Seattle. It spans 8.1 million square feet and includes 33 buildings. Amazon estimated its investments in its hometown from 2010 to 2016 have added $38 billion to the city's economy. Next, Amazon will work with each of the 20 finalists on their proposals. It says it plans to make a final decision sometime this year. Correction: An earlier version of this story incorrectly said 18 U.S. cities were finalists. Seventeen U.S. cities are finalists, another is a county and yet another is a region. The story has been updated. Correction: A previous version of this story said Amazon is considering 18 U.S. cities for its second headquarters. It's considering 17 U.S. cities. The story has been updated.